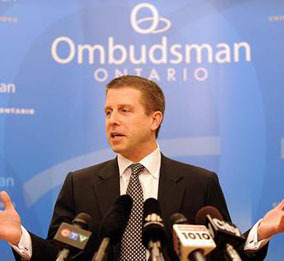 How good a job has André Marin really done as Ontario ombudsman? André Marin, Ombudsman Ontario. He has just been appointed to a second five-year term, but how good is he, really? It is a little late to do any good. But today’s Toronto Star article on how “André Marin left dysfunction and discontent as military ombud” has made me wonder a bit more about a question I’ve pondered a few times over the past month or so. Just how good a job has Mr. Marin really done as Ontario ombudsman over the past five years, anyway? Along with the Legislative Assembly of Ontario, Mr. Marin has recently won applause from such prominent provincial capital-city pundits as Jim Coyle at the Toronto Star, Peter Worthington at the Toronto Sun, and Christie Blatchford at the Globe and Mail. The current conventional wisdom seems to be that Premier McGuinty and the executive branch have not liked Ombudsman Marin, because he has not been willing to “soften his attacks on the government.” Now, however, the deeper public interest has triumphed. The people of Ontario’s fearless crusader is back in business for another five years! I should reveal that, way back in the late 1960s and early 1970s, as a somewhat idealistic young man, I spent a few years working for what was then known as the assessment standards branch in the Ontario Department of Municipal Affairs. And during this time I became impressed by how complex and interesting the many different regional and local real estate markets in the glorious province of Ontario are — and how challenging the process of equitably valuing or assessing real estate for purposes of property taxation can be. I should add that for the past number of decades I have worked in the self-employed regions of the private sector. And as a one-time minor public sector bureaucrat who has seen the light, I yield to no one in the depths of my conviction that all branches of the public sector stand in need of constant criticism and “tough and thorough” investigation, etc, etc — including the Municipal Property Assessment Corporation (“MPAC”) in Ontario. Yet even today as I re-read Mr. Marin’s 2006 report on MPAC, it still strikes me in many places as quite naive, ill-informed on what remains a complicated if always controversial subject, and considerably more concerned to advance the interests of André Marin than those of the Ontario public. The Latin author Juvenal’s ancient motto — loosely translated as “who watches the watchmen” — something someone should be thinking about during André Marin’s second term as Ontario ombudsman, or ombud, or ombudsperson, etc, etc. There is much in Mr. Marin’s subsequent career that seems to me to have casually bolstered my agnosticism about his job performance. Among other things he often appears to have changed the essentially administrative-wrangling nature of an ombudsman’s job into something much more akin to the job of an elected politician — without himself being elected. Again, I could be wrong. And I will be happy enough if Mr. Marin’s next five years turn out well. Meanwhile, the question that lingers in my mind is the ancient one of the Latin author Juvenal — Quis Custodiet Ipsos Custodes? Or “Who watches the watchers?” I hope that someone in the Ontario mass media — and the Ontario Legislative Assembly, for that matter — will also be paying some attention to this question during André Marin’s second term in unelected office. He needs to be held accountable to someone or something, just like everyone else. Randall White has written a number of books on regional history and politics, including Ontario 1610-1985: A Political and Economic History and Ontario Since 1985: A Contemporary History. Randall, thank you for bringing attention to the fact that Mr Marin is unelected and has no oversight. If people were not nervous before, his unilateral assumption of powers that are not even near his jurisdiction in his G20 report should scare people. At the same time, he challenged the Toronto Star’s summer coverage of the numerous Human Rights Tribunal cases against him by taking the Star to the Press Council. So we have a man with a giant ego, no oversight, not assume power, has an entitlement complex, has vowed to “hunt down” anyone who speaks against him and will attack the media if they report negatively on him. What country do will live in again? Marin is all form and no substance. An arrogant self promoter. Its about time the media looked more closely at the substance of his work.